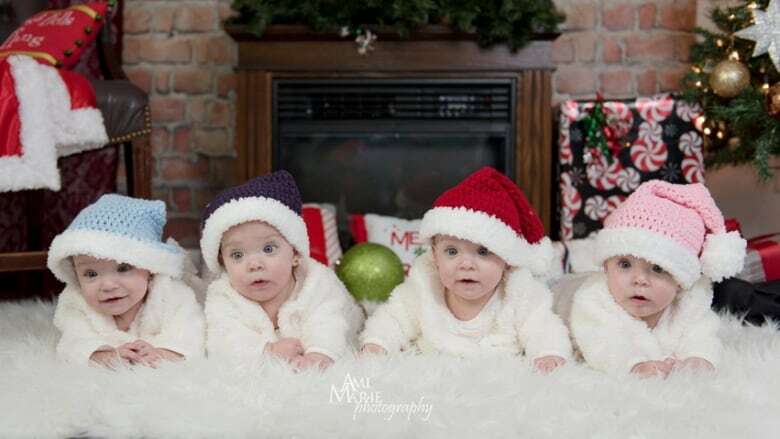 Alberta's superstar quadruplets who went viral on social media after their birth are taking the internet by storm again, this time in delightful Christmas pictures. 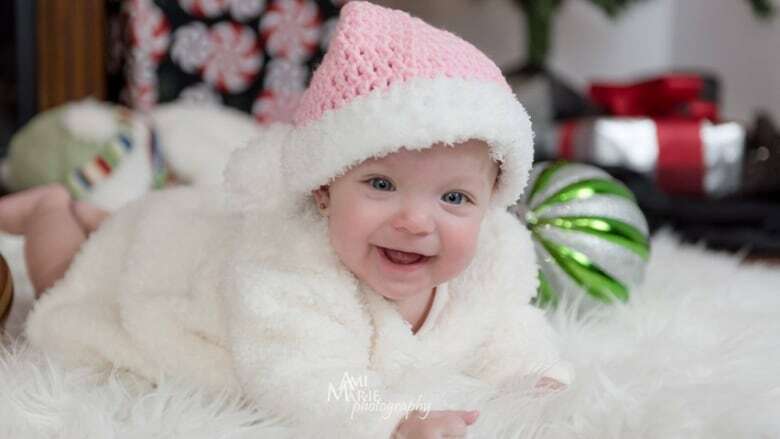 The identical quadruplets who became social media stars after their birth in Alberta in May are turning heads on the internet again, this time for photos showcasing their lovable smiles in adorable Santa hats. Emily, Grace, McKayla and Abigail Webb posed for their Christmas photos in November in different coloured hats to make it easy to tell them apart. 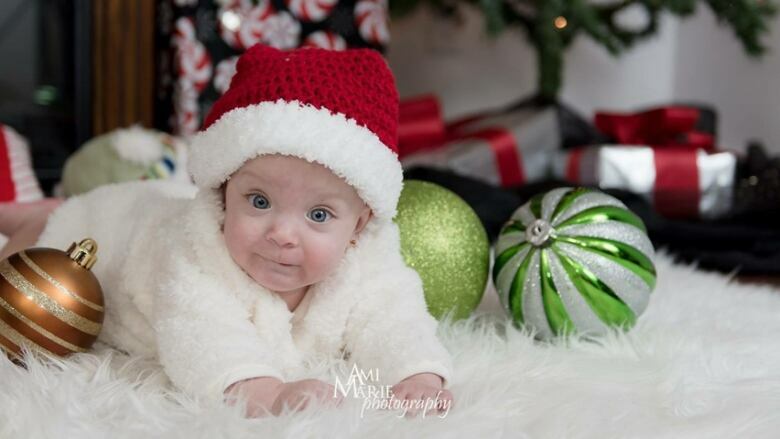 The tuques were specially crocheted by their photographer, Ami Marie. "They do quite like getting their pictures taken. 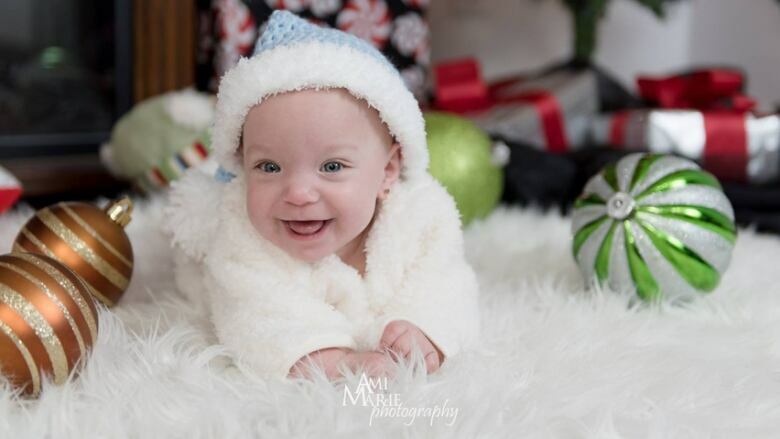 They smile and they laugh and they really quite like the camera," said their mother, Bethani Webb, from Hythe, about 500 kilometres northwest of Edmonton. 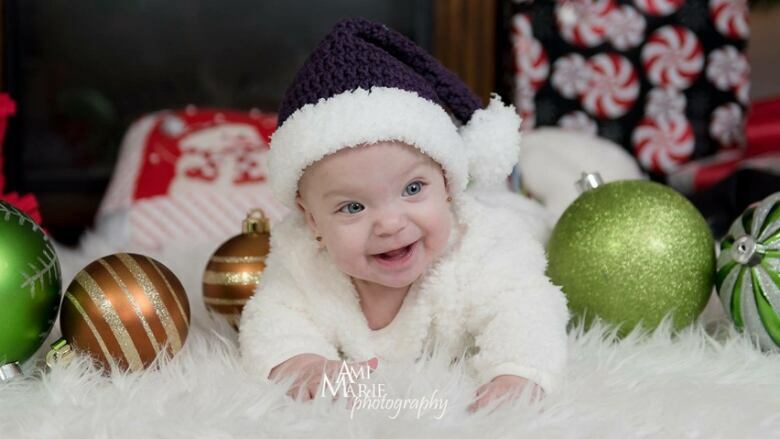 Life has changed a lot for Webb and her husband Tim Webb since their girls were born in May. The family ran out of space in their one-bedroom apartment, so they're now living in Tim's mother's house in Hythe. They've got more space as a result, but that still doesn't help when the babies get hungry. "They like to cry all at once when they're hungry, so trying to get them all fed and happy at the same time can be kind of difficult," Bethani Webb said, describing feeding time as the biggest challenge at the moment. The initial test of telling the girls apart is easier now that they're seven months old. In addition to wearing colour-coded earrings, all four are now starting to develop their own unique personalities. "Emily is kind of the energetic crazy one," Webb said, adding she can also be a bit of a finger-biter. She describes Abigail as the calm one who is always smiling and happy. Grace could be the first one to crawl since she kicks a lot, and McKayla might be the first one to start talking. "She's always babbling," Webb said. But while the quadruplets are changing and growing so quickly, one thing that hasn't changed yet is how they just love to be together. "They definitely get a little lonely when they're not with their sisters," Webb said. The girls are always happy around their father, as well. They look forward to playing with him when he gets home from work. "He's doing really good," Webb said with a laugh, "slowly getting more adjusted to having four daughters." 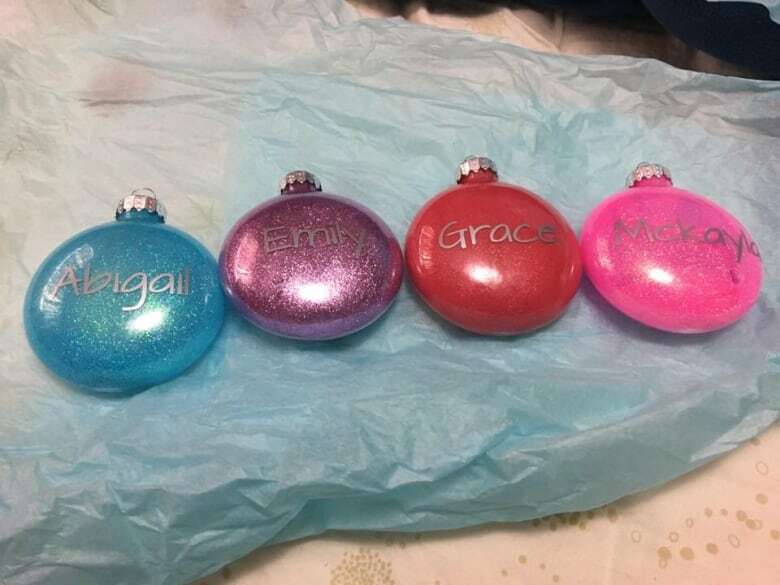 The family is planning a Christmas at home in Hythe with bonding time around the tree and the highlight of the girls' attempting to open their first presents. While they're still too young to ask for anything, Webb is sure that if they could, it would be something related to one of their favourite things — bath time. "They probably want some bath toys from Santa," she said. "They really quite enjoy their baths, so it would be nice for them to get some bath toys."